Most clients opt to be informed of their rankings on a monthly basis. This is done via the Rankings Report, sent on the 1st of each month. 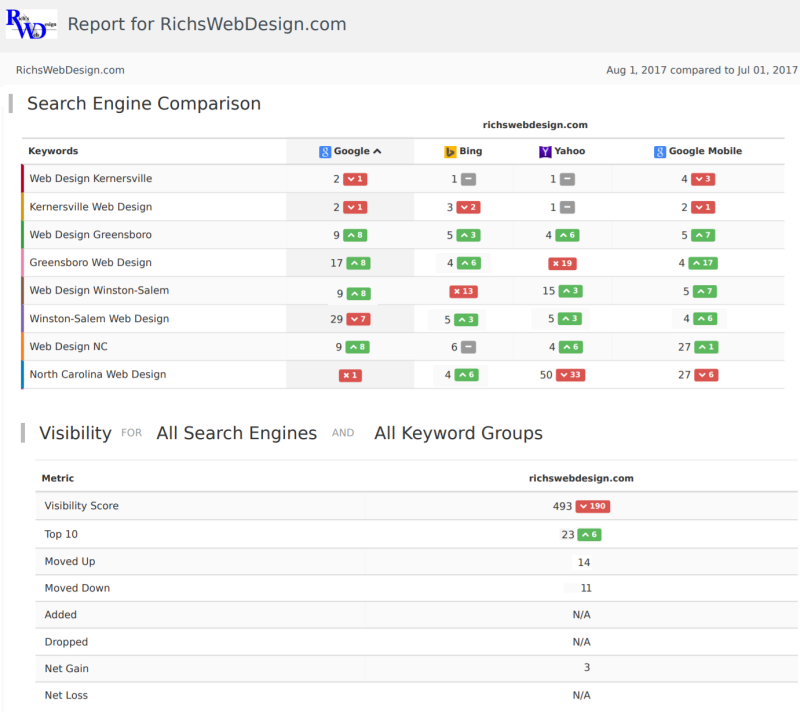 Quite a few clients of Rich’s Web Design have asked me “What does my ranking chart mean?” “You email it to me, but I never can understand it.” Here is the best explanation – The report shows how your targeted phrases show up on the major search engines SERP(Search Engine Results Page), in a given moment in time. Seeing single digit numbers means that you are in the Top-10. The above Monthly Rankings Report is in a new and improved format. The 1st page (Search Engine Comparison) shows your targeted search phrases and how they rank today in the major search engines (Google, Bing, Yahoo & Google Local). The 2nd page (Visibility) shows your Visibility Score (higher is better), how many phrases are in the Top 10, how many moved up / down, were dropped or added to search results and the overall net gain / loss. The VERY first thing I look at are the two sections “Moved Up” & “Moved Down” 1 . This week, 6 of the phrases “moved up” in the rankings and 3 “moved down”. If any of these phrases were “dropped” or “added” then the numbers would show directly below. The “Visibility Score” and the “Visibility Percent” 2 are calculations based on points given to higher ranking phrases and the overall total. A position of 1 = 30 pts., 2 = 29 pts … A ranking of 30 = 1 point, etc. A higher percentage is better! The actual rankings 3 are the meat of the chart. This shows the actual rankings for your individual phrases / words for this day for each of the 3 major search engines. If your phrase went UP from last weeks report, then a green up arrow will show. For example, the two phrases above, “Kernersville Business News ” and ‘Kernersville Local Information‘ for both Yahoo & Google, went up this week. 1 1 means that it is NOW #1 and moved up by 1 place. If your phrase went DOWN, then a red will show. For example, this site went down on Yahoo for “Kernersville Businesses”. 4 3 means that this week it ranks #4; It moved “down” 3 places. Last week it was #7. Newer sites will see 4 which simply means that your phrase(s) are now showing up on search results pages. These ranking charts have NOTHING to do with reporting the number of visitors to your site. The only statistical similarity is the fact that … if your site ranks high for your phrases and people search for these phrases, THEN more people will be visiting your site. The report shows how your targeted phrases show up on the major search engines SERP(Search Engine Results Page), in a given moment in time.